When Jesus' disciples would have dismissed the little children thronging around Him, Jesus revealed the value and preciousness of children and how their simple faith was a model for everyone. In this DVD, Jack Hayford shows us what Jesus wants us to understand about children and being childlike. First, he describes why we need to embrace, invest in and give a heritage of faith to children. He then stresses our need to receive children as though we are receiving Jesus Himself. Finally, he underscores our responsibility to nurture and protect children from the "12 dirty dozen" things that hurt and offend a child's heart. 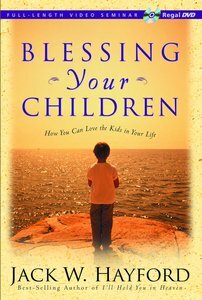 BLESSING YOUR CHILDREN is a great tool for preparing parents for their children's dedications and blessings. 75 minutes. Jack Hayford was the founding pastor of the 12,000-member The Church On The Way which he pastored until recently, chancellor of the King's Seminary in Los Angeles, and president of The International Church of the Foursquare Gospel. He has written more than 36 books and 600 hymns and choruses. His daily radio and weekly television programs reach nationally and globally. This "Pastor to Pastors" now focuses his ministry chiefly on issues of church leadership and on expanded outreach to denominational and interdenominational gatherings at colleges, seminaries, parachurch and other organizations around the world. He and his wife, Anna, live near Los Angeles, California.- Publisher.